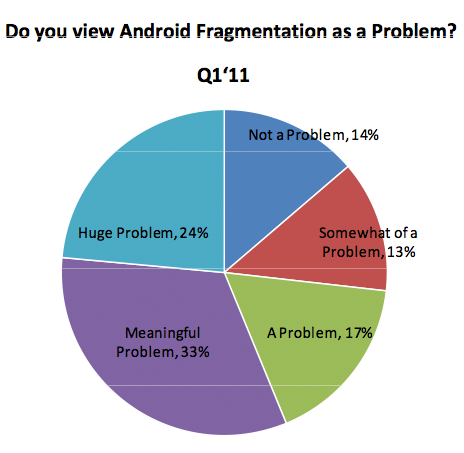 The chart you are staring at above displays the results of a survey that asked 250 “working” developers if they thought fragmentation on Android was a problem. As you can see, 86% of them said that it was in some form a problem with 74% saying it is definitely something they worry about. We’ve heard the cries of tech pundits who have suggested all along that fragmentation was evil, even while some of the bigger app developers (like Rovio) would say otherwise, so in a way, this should make a lot of talking heads feel special today. On a related note though, we know that Google is already working to eliminate mass fragmentation by tightening up their Android policies, making it harder for manufacturers to simply release anything they please without a plan to stay current. We should also point out that 71% of those who responded to the survey said they were developing for Android with just 61% giving the thumbs up to iOS. Obviously fragmentation isn’t causing too much harm.